"Flying" is an instrumental recorded by the Beatles which first appeared on the 1967 Magical Mystery Tour release (two EP discs in the United Kingdom, an LP in the United States). It is one of the few songs credited to all four members of the band: John Lennon, Paul McCartney, George Harrison, and Ringo Starr. The first instrumental written by the Beatles since "12-Bar Original" in 1965, this was the first song to be credited as being written by all four members of the band with the writing credits of "Harrison/Lennon–McCartney/Starkey". Like "12-Bar Original," it was based on the classic twelve-bar blues chord progression. "Flying" was recorded on 8 September 1967 with mellotron, guitar, bass, maracas, drums, and tape loops overdubs on 28 September under its original title of "Aerial Tour Instrumental." The end of the recording originally included a fast-paced traditional New Orleans jazz-influenced coda, but this was removed and replaced with an ending featuring tape loops created by John Lennon and Ringo Starr during the 28 September session. The loops extended the song to 9 minutes 38 seconds, but the track was cut down to only 2 minutes 17 seconds. Part of the loops were used alongside an element of the ending jazz sequence to make "The Bus", an incidental piece used at various points in the TV movie. On the track as recorded and officially released, Lennon plays the main theme on mellotron, accompanied by McCartney and Harrison (both on guitars, plus a later McCartney bass overdub) and Starr (on maracas and drums). 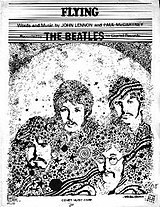 All four Beatles sing the melody without lyrics of any kind, and the track fades in an assortment of tape effects created by Lennon and Starr. This released version is identical to that heard on the soundtrack of the Magical Mystery Tour film; the music is accompanied in the film by colour-altered images of landscape in Iceland taken from an aeroplane, as well as some unused footage from the 1964 Stanley Kubrick film Dr. Strangelove or: How I Learned to Stop Worrying and Love the Bomb. Japanese progressive rock band Yonin Bayashi covered "Flying" for their 1976 album Golden Picnics. In 1977, the Residents covered "Flying" on the Residents Play the Beatles side of their The Beatles Play the Residents and the Residents Play the Beatles single release. The single is now fairly difficult to obtain, although the track can be found on the discontinued CD release of The Third Reich 'n Roll as a bonus track. Shockabilly included a cover of "Flying" for their 1984 album Vietnam. The Secret Machines also covered it for the film Across the Universe. Mark Wood (Trans-Siberian Orchestra, Mark Wood Experience, Electrify Your Strings) covered "Flying" on his album Sanctuary. It is also included on his album These Are A Few Of My Favorite Things. ^ a b c Lewisohn 1988, p. 123. ^ Mike Pinder Presents Mellotron Samples. Alan W. Pollack's Notes on "Flying"